Kevin Harvick started second and finished second, scoring nine bonus points. The No. 4 Busch Beer Ford raced to the lead on lap 12. Harvick surrendered the lead on lap 25 to pit under green-flag conditions for four tires, fuel and chassis adjustments. He reclaimed the lead on lap 35 but fell to the second position, reporting the car was loose off the corner. The Busch Beer team brought the car to pit road at the completion of Stage 1 for four tires, fuel and chassis adjustments. Started second and finished first to earn 10 bonus points and a playoff point. Harvick raced to the lead on the initial restart. The No. 4 Ford surrendered the lead on lap 78 when Harvick came to pit road for four tires and fuel under green-flag conditions. Harvick reclaimed the lead on lap 82 and held it for the remainder of the stage. The Busch Beer team brought the No. 4 Ford to pit road for four tires, fuel and chassis adjustments at the end of Stage 2. Started first and finished fourth. Harvick raced back out to the lead to start the final stage. The team came to pit road under caution on lap 126 for four tires, fuel and chassis adjustments, but an issue on pit road caused the team to restart second on lap 129. Following the lap-129 restart, Harvick fell back to the third position until the next caution on lap 139. The team elected to stay out under caution on lap 139 to restart in the second position, but Harvick lost a position on the restart. Harvick and the team elected to stay out for the final flurry of cautions on laps 146 and 150. The team restarted in the fourth position on lap 153 and remained there until the checkered flag on lap 160. This was Harvick’s 10th top-five and 11th top-10 finish of 2018. 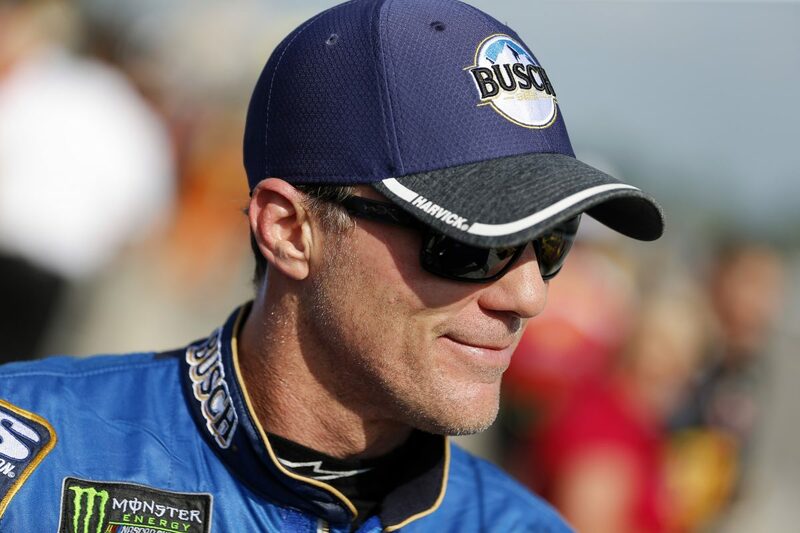 Harvick earned his 11th top-five and 16th top-10 in 35 career Cup Series starts at Pocono. Harvick finished second in Stage 1 to earn nine points and won in Stage 2 to earn an additional 10 bonus points and a playoff point. Harvick led four times for a race-high 89 laps to increase his laps-led total at Pocono to 157. Harvick has now led exactly 12,000 laps in his NASCAR career. He is the 15th driver to accomplish this feat.